One of my goals for the blog (from last year) was to go back and re-feature some of my favorite recipes that I shared on the early days of this blog. You know the ones that are tried and true and that I keep remaking over and over again. I thought that this would be a fun ‘Friday Flashback’ feature. Of course I would include *new* and *improved* photos as part of this feature because we all know how my photography was slightly offensive in the early days! Today’s recipe is one of those recipes! It is one I turn to when I need a fast and easy dinner that won’t cost a fortune either. 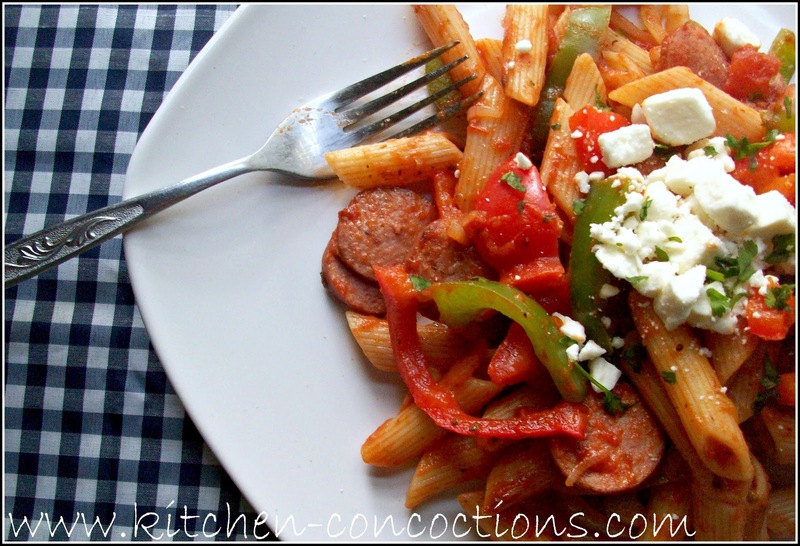 We have eat this Sausage and Pepper Arrabbiata (formerly called ‘Angry’ Sausage and Pepper Pasta in my original post since arrabbiata means angry in Italian) on a regular basis and it is always a hit! PS: I know what you are thinking, I said last week that I wanted to eat fresher, less processed foods as my goal/resolution for the new year. And yes that is true, and while this pasta dish uses jarred pasta sauce, there are quiet a few varieties of jarred sauce that I have found that use fresh ingredients, are low in sodium, and are free from all those icky preservatives, just read your labels and you can find a sauce that is right for you! Also this dish is packed full of so many other fresh ingredients that I am totally ok with using a jarred sauce to save some time and money! Slice peppers and onions into long thin pieces. Set aside. In a large skillet over medium-high heat, brown sausage links on all sides. Continue to cook until sausage is thoroughly cooked all the way through. Once fully cooked, remove sausage from pan, cool slightly and slice. In the same pan the sausage was cooked, add the olive oil, peppers and onions and sauté for 5 minutes. Add minced garlic and sauté for 1-2 minutes more. After veggies have cooked, add the sliced sausage back to the pan along with the sauce, crushed red pepper, and Italian seasoning. Season to taste with salt and black pepper. Cook until sauce is heated through.